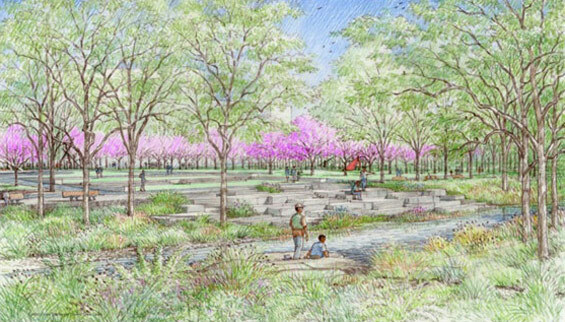 Recently the groundbreaking occurred for Phase One of Mill River Park in Stamford, Connecticut. OLIN has developed the Mill River Park and Greenway Master Plan, a plan for a 28-acre park on both sides of Mill River, from Broad Street to Pulaski Street, which will serve as a new destination for Stamford residents and area employees. 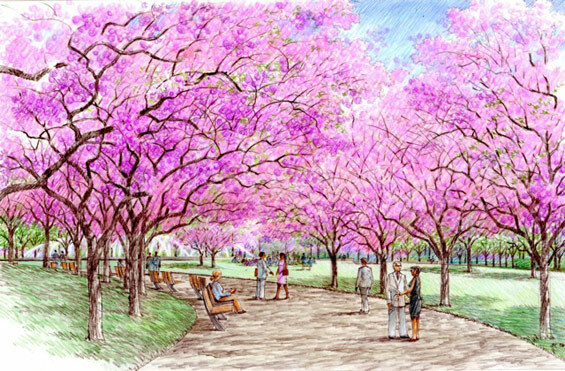 Phase One encompasses 12 acres of the 28-acre site and will feature new plantings, pathways and continuous riverfront trail, a lawn for recreation and public events, as well as a terrace for visitors to explore the river’s edge. Completion of Phase One is scheduled for Spring 2013. 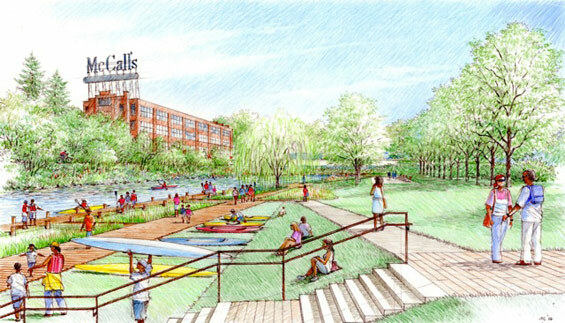 OLIN’s design for Mill River Park will bring an active, vibrant and verdant environment to Stamford’s downtown riverfront. By forging connections between adjacent neighborhoods, a prominent and accessible place will be created for the entire community. 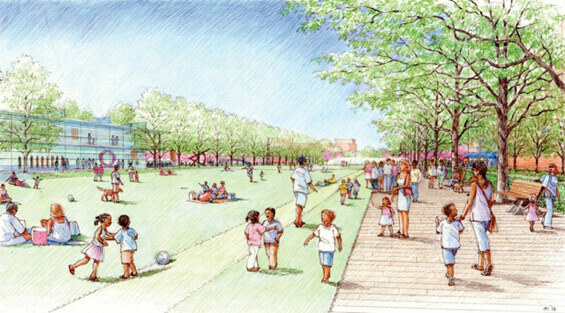 The Great Lawn, the North and South Promenades and Stepped Terrace Outfall will provide residents with numerous opportunities to explore and discover the restored river. The River Walk is a riverfront pathway ideal for walking and jogging, as well as resting and enjoying the view. A carousel, café, fountain and ice-skating rink will offer year-round leisure, entertainment and recreational opportunities. The planting palette of the river’s edges and slopes is designed to be durable and capable of withstanding storm events. The park’s myriad native plants, including grasses, wildflowers, shrubs and trees, were carefully chosen to revitalize degraded aquatic and terrestrial habitats. The central element of the project is the restoration of Mill River, including the removal of the Mill Pond dam and walls and the reconstruction of a natural river channel bordered by banks vegetated by native trees and plants. 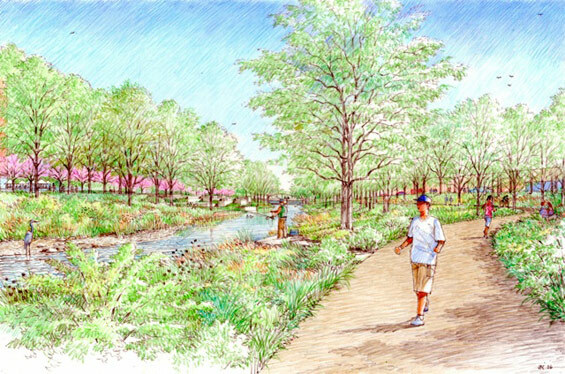 The design for the Mill River Park and Greenway project aims to restore the aquatic, terrestrial and migratory bird species within the park. In addition, the river restoration will open up an anadromous fish passage to the upper reaches of Mill River, improve aquatic diversity within the river, and enhance overall water quality.